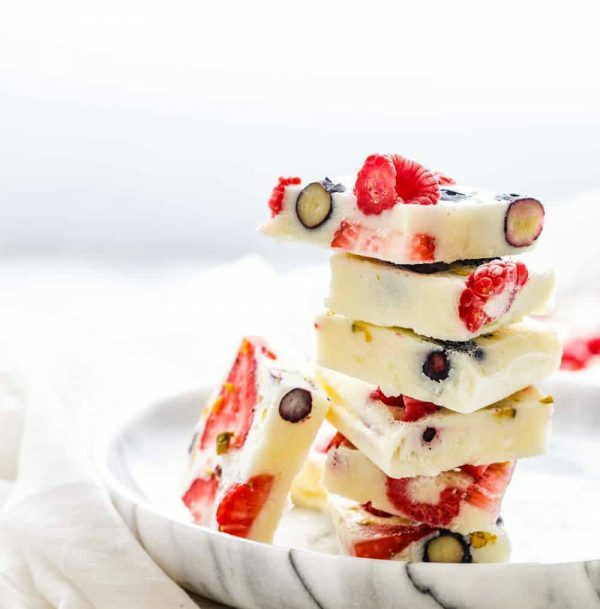 Frozen yogurt bark topped with mixed berries and crushed pistachios – super easy, delicious and a refreshing no-cook recipe that is perfect for breakfast, snack or dessert! Before my wedding, I managed to lose 5 kilos (11 lbs) in just 3 weeks by following a few simple rules. I controlled my portion size, I ate more fresh fruit and vegetables, I didn’t drink any liquids with my meals, and I made sure that I had 100-150 calorie breakfast within 1 hour of waking up. Having a small breakfast within 1 hour of waking up, helps increase the rate of your metabolism and eat less during the day. 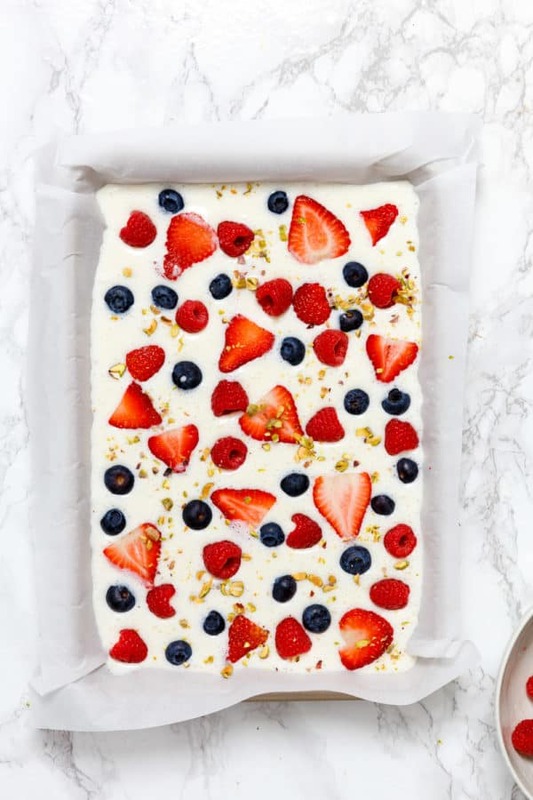 So I started experimenting with low calorie and low-fat breakfast recipes, and this frozen yogurt bark is one of the recipes that I’ve been making and loving in the past couple of months. To make this super easy and tasty recipe you only need 4 ingredients! Simply line a shallow baking tray with parchment paper. Then blend the frozen yogurt and maple syrup in a high-speed blender until smooth. It is not recommended to thaw frozen yogurt and refreeze it, so I use the blender method instead. yoomoo frozen yogurt is already sweetened so it’s up to you to add maple syrup or agave syrup or not. Pour the frozen yogurt mixture into the prepared baking tray and spread it smooth with the back of a spoon. Sprinkle the desired toppings over the blended frozen yogurt. I’ve used mixed berries and crushed pistachios, but feel free to add different fruits and toppings. Freeze the yogurt mixture for 2-3 hours or overnight until set. Cut into squares and serve cold before it starts melting, or store in a container in the freezer. yoomoo frozen yogurt is currently my favourite frozen yogurt brand, not only that it comes in different flavours and all of them are very tasty. But it’s also low in fat and calories. 100 grams of this frozen yogurt contain as little as 126kcal, and 1.2 grams of fat so it’s a lovely alternative to ice cream. 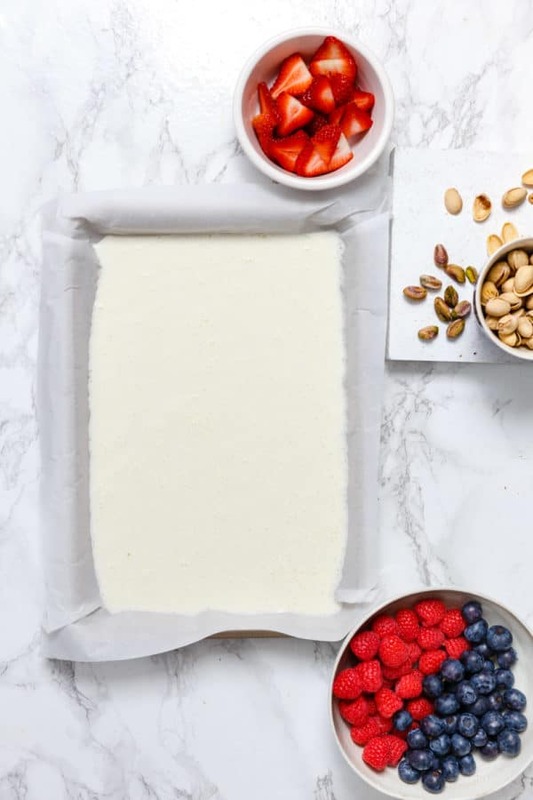 I usually eat yoomoo frozen yogurt with a spoon straight from the tub because it tastes great on its own, but it’s also great in recipes such as fruit smoothie bowls, this frozen yogurt bark or even served on the side with a breakfast waffle! yoomoo is UK’s number one frozen yogurt brand, and it’s available in all major UK supermarkets. These frozen yogurt bark squares are perfect for breakfast and make yummy treats to have during the day. They’re very convenient in the morning, as they don’t require any preparation and all you need to do is take them out of your freezer and enjoy them! I usually have 2 squares in the morning, as each square contains as little as 37 kcal. For more information on yoomoo frozen yogurt, visit their website or follow them on Instagram and Facebook. 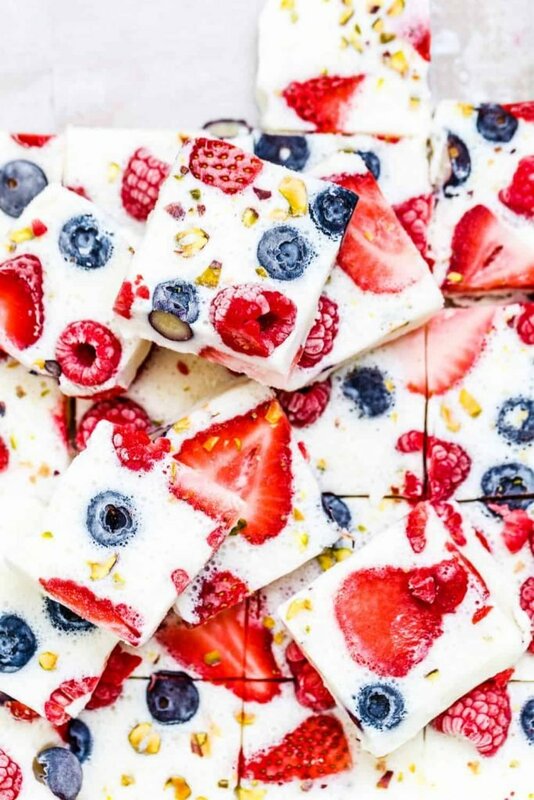 If you make this frozen yogurt bark, please don’t forget to rate this recipe and share a picture on social media. Tag #LittleSunnyKitchen in your posts as I would really love to see your creations! Line a shallow baking tray with a parchment paper. In a high-speed blender, add the yogurt & maple syrup and blend until smooth. Pour it into the prepared baking tray and spread it smooth with the back of a spoon. Sprinkle the desired toppings - Berries & Nuts. Freeze the yogurt mixture for 2-3 hours or overnight until set. Cut into squares and serve cold, or store in a container in the freezer. Did you make a recipe?Tag @littlesunnykitchen or hashtag it #littlesunnykitchen! i would never have thought to put these ingredients together myself, but it looks soooooo nice. can’t wait to try it. Very pretty indeed. Not sure I could start the day with something chilly but would also make a great dessert I’m thinking. This is a great way to start the day! Love the marble plate by the way. Super pretty! 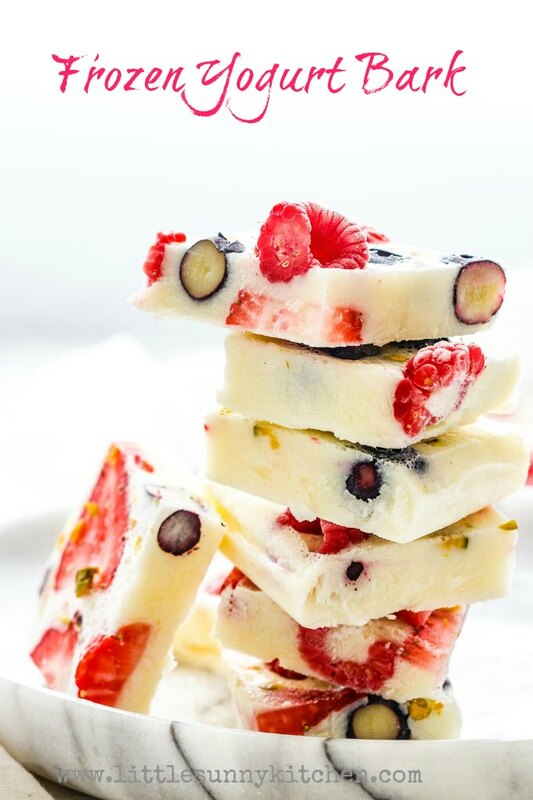 These frozen yogurt bars look so yummy! I have never heard of yoo moo yogurt but got to try it out now..
What a gorgeous breakfast recipe, and congratulations on both the wedding and the fabulous weight loss in such a short time! I’ll be trying this bark out soon! I’d love to have this in the freezer ready for me for breakfast. It’s so pretty! And I’m sure it’s tasty too. I never would have thought to do this with frozen yoghurt but it’s such a great idea! This is so pretty! My kids would love it as a treat on a hot day. This frozen yogurt looks fantastic! I’ll have to keep an eye out for it!! Love the idea of putting it in frozen yogurt bark – YUM!!!! wow I can’t even believe this is low cal! It looks so delicious!! I def want to try this! Diana Alshakhanbeh is a foodie, vegan trained chef and the recipe developer behind Little Sunny Kitchen.